A comparison of protein profiles of leaves during different stages of shoot and callus induction showed similarities as well as differences in the expression of proteins.Â A protein of 39 kDa was expressed in low levels in leaf explants and increased in intensity during induction of shoot organogenesis in both the cultivars. Analysis of protein patterns during organogenesis and callus proliferation from leaves by two dimensional gel analysis revealed the separation of 39 kDa protein into four spots during organogenesis with pI values ranging from 4.2-5.8.Â However, the isoforms of 39 kDa protein with pI values of 4.2 and 5.8 were highly expressed in callus of M-5 cultivar in contrast to S-36 cultivar where only one isoform with pI value of 4.2 was detectable. The analysis of protein synthesis in different stages of development in the cultures may acts as markers to differentiate the group of specific isoforms. Chitra, D. V., B. Chinthapalli, and G. Padmaja. “Protein Difference Among the Leaf Explants Determined for Shoot Regeneration and Callus Growth in Mulberry (Morus Indica L.)”. 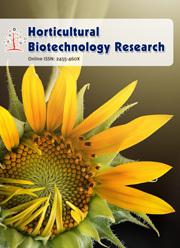 Research in Biotechnology, Vol. 8, &nbsp;, pp. 01-11, doi:https://doi.org/10.19071/rib.2017.v8.3201.